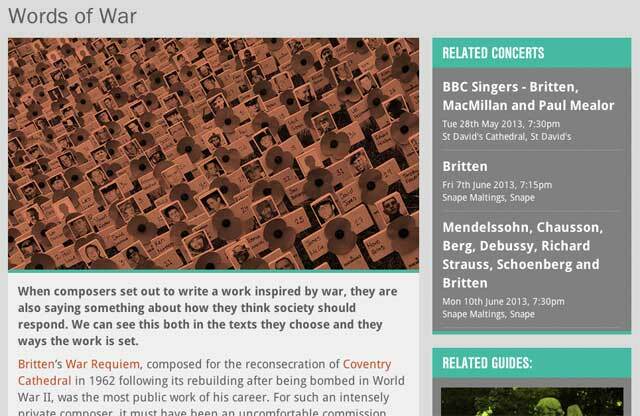 Concert Club is a prototype site built with Caper, in a project funded by the Technology Strategy Board and supported by BBC Radio 3. Concert Club was our response to the brief to ‘bring the live music experience home‘ for listeners who couldn’t attend concerts. For us, the live experience of classical music is something experienced in quiet reflection: it’s complex, and demands a lot of your brain. It’s not like sport; you don’t tweet halfway through a Mahler symphony about how great the wind are. But it’s still a very social experience: planning what to see, inviting friends, discussing it afterwards. So how could we share that feeling? We’ve come to explain Concert Club as book groups for classical music. The book group is a great model: a way of friends engaging with culture they otherwise might not; taking it in turns to take the lead about where the group will go next; discussing a complex work after the fact. It feels like what many people do after a concert, too – and so Concert Club provides a tool to facilitate that model for live classical music concerts on Radio 3. First, it provides a window onto Radio 3’s upcoming Live In Concert listings, letting you see concerts that are on iPlayer or coming shortly. 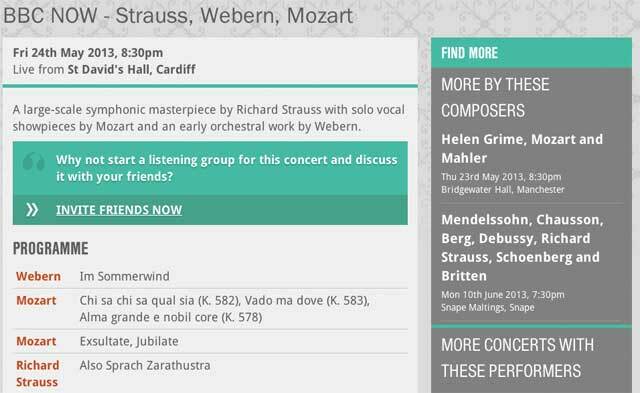 You can invite friends to listen through the site – and once you’ve created a listening group (or accepted an invite) you’ll be reminded when the concert comes onto iPlayer, and just before it leaves. And once you’re listening, you can share that fact with the world on Twitter. We haven’t built any discussion facility, quite deliberately – maybe you’ll want to talk about the concert on Facebook; maybe you’ll want to talk about it at someone’s house over a cup of tea, or in the pub. That facility already exists, so why rebuild it? But then, when you want to schedule something to listen to, or discover new music: Concert Club is there. And if classical music is all a bit daunting, the site also features editorial guides that provide thematics ways in to the Live In Concert catalogue. We’re really keen that these reflect a somewhat different tone to the Radio 3 website, bridging classical music to culture listeners might already be more familiar with. And because the concerts available are always shifting, so are the “relevant concerts” linked from these guides. Concert Club was an early prototype built swiftly, but it still had a complete loop of interaction: discovery, invitation, listening, sharing. It was live for a two month beta in 2013. In that time, I built all the code for the site: admin tools to ingest data from the BBC’s spreadsheets and then massage it into shape; a front-end derived from Dean Vipond‘s design work; and a back-end to serve up that data. The tight team – designer, developer, editor, production staff – all worked closely together throughout the project, delivering a surprisingly large amount of functionality in a short cycle.